Cernan passed away earlier this week on Monday, January 16, 2017 at age 82, after a long illness, surrounded by his family. Cernan, a naval aviator, flew on three groundbreaking missions for NASA during the Gemini and Apollo programs that paved the way for America’s and humanity’s first moon landing missions. His trio of historic space flights ultimately culminated with Cernan stepping foot on the moon in Dec. 1972 during the Apollo 17 mission- NASA final moon landing of the Apollo era. No human has set foot on the Moon since Apollo 17 – an enduring disappointment to Cernan and all space fans worldwide. Cernan also flew on the Gemini 9 and Apollo 10 missions, prior to Apollo 17. The Gemini 9 capsule is on display at the KSC Visitor Complex. Cernan was the second NASA astronaut to perform an EVA – during Gemini 9. The Cernan remembrance ceremony was held at the U.S. Astronaut Hall of Fame inside the newly opened ‘Heroes & Legends’ exhibit at the KSC Visitor Complex – two days after Cernan died. It included remarks from two of his fellow NASA astronauts from the Space Shuttle era, Kennedy Space Center Director Bob Cabana, and space shuttle astronaut Jon McBride, as well as Therrin Protze, chief operating officer, Kennedy Space Center Visitor Complex. A NASA portrait and floral wreath were on display for visitors during the ceremony inside and outside of the ‘Heroes and Legends’ exhibit. “He was an advocate for the space program and hero that will be greatly missed,” said Kennedy Space Center Director Bob Cabana during the ceremony inside. “I don’t believe that Gene is going to be the last man on the moon. And one of the things that he was extremely passionate about was our exploring beyond our own planet, and developing that capability that would allow us to go back to the moon and go beyond. “I feel badly that he wasn’t able to stay alive long enough to actually see this come to fruition,” Cabana said. NASA is now developing the SLS heavy lift rocket and Orion deep space capsule to send our astronauts to the Moon, Mars and Beyond. The maiden launch of SLS-1 on the uncrewed EM-1 mission to the Moon is slated for Fall 2018. “We are saddened of the loss of our American hero, Astronaut Gene Cernan. As the last man to place footsteps on the surface of the moon, he was a truly inspiring icon who challenged the impossible,” said Therrin Protze, chief operating officer of Kennedy Space Center Visitor Complex. Cernan was one of only 12 astronauts to walk on the moon. Neil Armstong and Buzz Aldrin were the first during the Apollo 11 moon landing mission in 1969 that fulfilled President Kohn F. Kennedy’s promise to land on the Moon during the 1960’s. Cernan retired from NASA and the U.S. Navy in 1976. He continued to advise NASA as a consultant and appeared frequently on TV news programs during NASA’s manned space missions as an popular guest explaining the details of space exploration and why we should explore. He advocated for NASA, space exploration and science his entire adult life. “Cernan was born in Chicago on March 14, 1934. He graduated from Proviso Township High School in Maywood, Ill., and received a bachelor of science degree in electrical engineering from Purdue University in 1956. He earned a master of science degree in aeronautical engineering from the U.S. Naval Postgraduate School in Monterey, Calif.
A funeral service for Capt. Eugene A. Cernan, who passed away Monday at the age of 82, will be conducted at 2:30 p.m. CST on Tuesday, Jan. 24, at St. Martin’s Episcopal Church, 717 Sage Road in Houston. NASA Television will provide pool video coverage of the service. The family will gather for a private interment at the Texas State Cemetery in Austin at a later date, where full military honors will be rendered. One of Apollo’s finest, astronaut Gene Cernan, has left Earth for the last time. Cernan, the last man to walk on the Moon, died Monday, January 16, 2017. “Even at the age of 82, Gene was passionate about sharing his desire to see the continued human exploration of space and encouraged our nation’s leaders and young people to not let him remain the last man to walk on the Moon,” the family continued. Cernan was a Captain in the U.S. Navy but he is remembered most for his historic travels off Earth. He flew in space three times, twice to the Moon. He was one of 14 astronauts selected by NASA in October 1963. He piloted the Gemini 9 mission with Commander Thomas Stafford on a three-day flight in June 1966. Cernan was the second American to conduct a spacewalk, and he logged more than two hours outside the Earth-orbiting Gemini capsule. During his two hour, eight minute spacewalk on June 5, 1966, Gemini IXA pilot Eugene Cernan is seen outside the spacecraft. Credit: NASA/Tom Stafford. In May 1969, he was the lunar module pilot of Apollo 10, and dramatically descended to within 5 km (50,000 ft) of the Moon’s surface to test out the lunar lander’s capabilities, paving the way for Apollo 11’s first lunar landing two months later. Apollo 17 Mission Commander Eugene A. Cernan during the second spacewalk on December 12, 1972, standing near the lunar rover. Credit: NASA. But his ultimate mission was landing on the Moon and walking across its surface during the Apollo 17 mission, the sixth and final mission to land on the Moon. During three EVAs to conduct surface operations within the Taurus-Littrow landing site, Cernan and his crewmate Harrison “Jack” Schmitt collected samples of the lunar surface and deployed scientific instruments. On December 14, 1972, Cernan returned to the lunar module Challenger after the end of the third moonwalk, officially becoming the last human to set foot upon Moon. The words of Cernan as he left the Moon’s surface bring us hope, for one day embarking on human missions of exploration of space once more. “We shall return, in peace and hope, for all mankind.” – Gene Cernan. Had fallen, leaving a poorer world behind. And another one has gone. When Apollo 17 lifted off from the moon, a camera captured the movements of the spacecraft — even though nobody was left behind to, say, establish a lunar base. How was that possible? 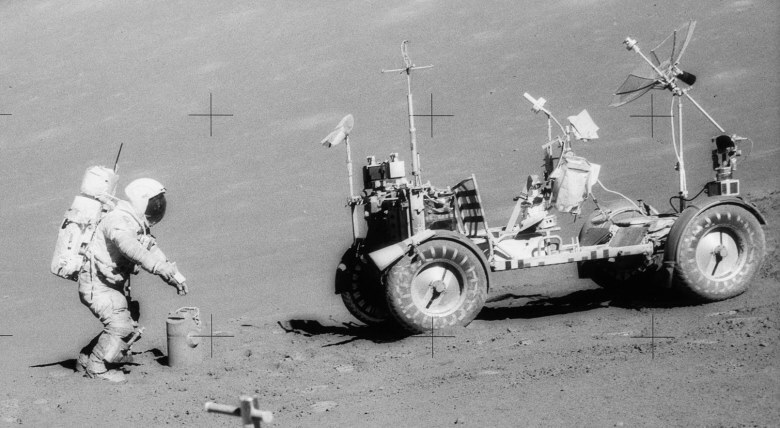 With a camera on the lunar rover that could be controlled — or even programmed — from Earth. Pretty impressive technology for the takeoff 42 years ago yesterday (Dec. 14) in 1972, although it took three tries to get the technique right. As the Smithsonian National Air and Space Museum explains in a 2011 blog post, the camera was available on Apollos 15, 16 and 17. 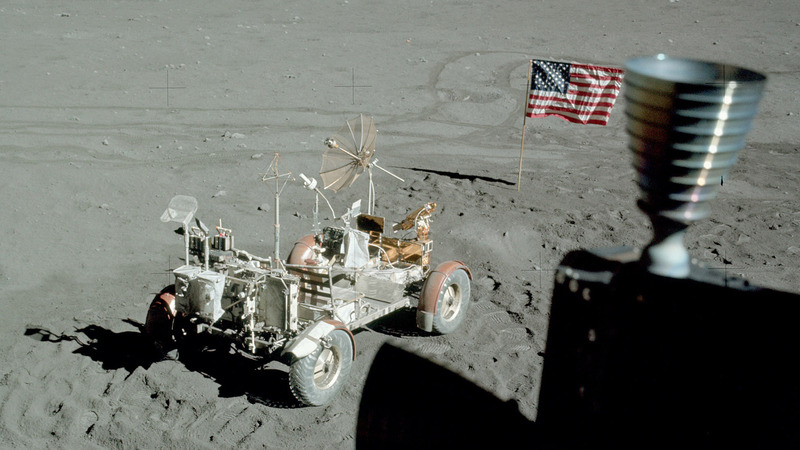 The television camera communicated from Earth using a high-gain antenna on the rover, but there was a slight time delay for the radio waves to travel (a couple of seconds) between the Earth and the Moon. So the engineers suggested moving the rover a certain distance from the lunar module and setting the camera to automatically tilt to show the lunar liftoff when commanded from Earth. That was the plan, at least. On Apollo 15, the tilt mechanism malfunctioned and the camera never moved upwards, allowing the lunar module to slip out of sight. And while the attempt on Apollo 16 gave a longer view of the lunar module rising up, the astronauts actually parked the rover too close to it, which threw off the calculations and timing of the tilt upwards so it left view just a few moments into the flight. Ed Fendall was the person doing the controlling. In an oral history for NASA done in 2000, he recalled how complex the procedure was. Now, the way that worked was this. Harley Weyer, who worked for me, sat down and figured what the trajectory would be and where the lunar rover would be each second as it moved out, and what your settings would go to. That picture you see was taken without looking at it [the liftoff] at all. There was no watching it and doing anything with that picture. As the crew counted down, that’s a [Apollo] 17 picture you see, as [Eugene] Cernan counted down and he knew he had to park in the right place because I was going to kill him, he didn’t — and Gene and I are good friends, he’ll tell you that — I actually sent the first command at liftoff minus three seconds. And each command was scripted, and all I was doing was looking at a clock, sending commands. I was not looking at the television. I really didn’t see it until it was over with and played back. Those were just pre-set commands that were just punched out via time. That’s the way it was followed. For a brief period in the 1960s and 1970s, 12 people ventured all the way to the surface of the Moon. The accomplishment at the time was hailed as a political victory over the Soviet Union, but as decades have passed the landings have taken on more symbolic meaning with NASA — a time of optimism, of science and of the American spirit. The last lunar landing was Apollo 17, which took place on Dec. 11, 1972. Commander Eugene Cernan and lunar module pilot Harrison Schmitt did three moonwalks in the Taurus-Littrow valley, scoping out the highlands to try to get a geologic sense of the area. Among their more memorable findings are orange soil. You can see some pictures from their sojourn below.